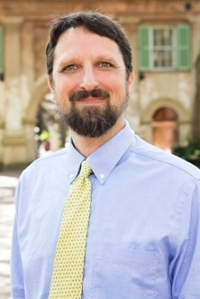 Todd LeVasseur earned his PhD (2011) in the Department of Religion at the University of Florida, where he studied religion and nature, environmental ethics, and North American religious history. An alumnus of the College of Charleston, he returned to his alma mater to teach during the 2010-12 academic years. The Indian biologist and philosopher of science Meera Nanda has created a version of the "Hippocratic Oath," but for public intellectuals. It reads as follows: "Ideas have consequences. Those of us who trade in ideas have a responsibility to ensure that our ideas should do no harm." In a similar spirit, the religion scholar Thomas Tweed made the following statement about education: "When it's effective, teaching—and learning—means moving back and forth between the familiar and the strange, and the familiarization of the other generates a limited but transformative empathy, which is one mark of the educated person, the humane neighbor, and the effective citizen. Teaching—and learning—is transport that transforms." My teaching philosophy is thoroughly shaped by these two quotes. -truism that religion is everywhere, and shapes everything, and my courses hope to introduce students to this realization of the importance of religion in everyday life around the world. In my classes I invite students to explore how “religion” interacts with, shapes, and is shaped by politics; economics; issues of race, class, and gender; the natural world; and colonialism and imperialism, past and present. It is a quasi-truism that religion is everywhere, and shapes everything, so that in my courses I hope to introduce students to this realization of the importance of religion in everyday life to people and institutions around the world. In terms of research interests, I study the interface of religious beliefs/experiences/institutional identities/practices (and cultural narratives and identities, broadly), and how these both shape and are shaped by the natural, "more-than-human" world. The overarching research question that guides my scholarly path is how can the human animal, from individual to global scales, learn to actively generate just, resilient, regenerative, and sustainable lifeways as we move deeper into the Anthropocene? Religious Agrarianism and the Return of Place: From Values to Practice in Sustainable Agriculture. SUNY Press, 2018. Finalist – 2017 Foreword INDIES Book of the Year Award in the Religion category. Gold Medalist – 2018 Independent Publisher Book Awards in the Religion Category. Examines religious communities as advocates of environmental stewardship and sustainable agriculture practices. Writing at the interface of religion and nature theory, US religious history, and environmental ethics, Todd LeVasseur presents the case for the emergence of a nascent “religious agrarianism” within certain subsets of Judaism and Christianity in the United States. Adherents of this movement, who share an environmental concern about the modern industrial food economy and a religiously grounded commitment to the values of locality, health, and justice, are creating new models for sustainable agrarian lifeways and practices. LeVasseur explores this greening of US religion through an extensive engagement with the scholarly literature on lived religion, network theory, and grounded theory, as well as through ethnographic case studies of two intentional communities at the vanguard of this movement: Koinonia Farm, an ecumenical Christian lay monastic community, and Hazon, a progressive Jewish environmental group. Religion and Ecological Crisis: The "Lynn White Thesis" at Fifty. Routledge, 2017, Edited by Todd LeVasseur and Anna Peterson. In 1967, Lynn White, Jr.’s seminal article The Historical Roots of Our Ecologic Crisis was published, essentially establishing the academic study of religion and nature. This collection of original essays by leading scholars in a variety of interdisciplinary settings, including religion and nature, environmental ethics, animal studies, ecofeminism, restoration ecology, and ecotheology, considers the impact of White’s arguments, offering constructive criticism as well as reflections on the ongoing, ever-changing scholarly debate about the way religion and culture contribute to both environmental crises and to their possible solutions. Religion and Ecological Crisis addresses a wide range of topics related to White’s thesis, including its significance for environmental ethics and philosophy, the response from conservative Christians and evangelicals, its importance for Asian religious traditions, ecofeminist interpretations of the article, and which perspectives might have, ultimately, been left out of his analysis. Religion and Sustainable Agriculture: World Spiritual Traditions and Food Ethics. The University Press of Kentucky, 2016, Edited by Todd LeVasseur, Pramod Parajuli, and Norman Wirzba. In this wide-ranging collection, eminent scholars, theologians, activists, and lay farmers illuminate how religious beliefs influence and are influenced by the values and practices of sustainable agriculture. Together, they analyze a multitude of agricultural practices for their contributions to healthy, ethical living and environmental justice. Throughout, the contributors address current critical issues, including global trade agreements, indigenous rights to land and seed, and the effects of postcolonialism on farming and industry. Covering indigenous, Buddhist, Hindu, Christian, Muslim, and Jewish perspectives, this groundbreaking volume makes a significant contribution to the study of ethics and agriculture. Advancing Nonviolence and Social Transformation: Deep Green Violence: Our Animal Bodies as Sites of Resistance. Edited by Heather Eaton and Lauren Michelle Levesque. The Routledge Handbook of Ecolinguistics: Religion, Language and Ecology. Routledge, 2018, edited by Alwin F. Fill and Hermine Penz. Sustaninability and Peaceful Coexistence for the Anthropocene: It's getting better and better, worse and worse, faster and faster. Edited by Pasi Heikkurinen. "Sustainability Effort Takes Shape at CofC." College of Charleston Magazine, 2016. "Methane Dispensers and Bio-Dynamic Beings: Cattle as Polysemous Symbols in Environmental Religious Discourse." European Journal of Literature, Culture and Environment, 2016. "Toward resilient food systems through increased agricultural diversity and local sourcing in the Carolinas." Journal of Environmental Studies and Sciences, 2015. "Pope Francis challenges ideologues on climate change." The Post And Courier, 2015. “Agrarianism.” The SAGE Encyclopedia of Food Issues, Ed. Ken Albala. SAGE Reference, 2015. “Deforestation for Agriculture.” The SAGE Encyclopedia of Food Issues, Ed. Ken Albala. SAGE Reference, 2015. "Teaching Sustainability via the Environmental Humanities: Studying Water, Studying Ourselves." Journal of Sustainabiity Education. Vol. 7 (2014). "Defining “Ecolinguistics?”: Challenging Emic Issues in an Evolving Environmental Discipline" Journal of Environmental Studies and Sciences, Springer. 2014. "Koinonia Partners: A Demonstration Plot For Food, Fellowship, And Sustainability." Religion, Food, And Eating In North America. 2014. pg. 253. Ch. 13. "Globalizing the Ecovillage Ideal; Networks of Empowerment, Seeds of Hope." Environmental Anthropology Engaging Ecotopia: Bioregionalism, Permaculture, and Ecovilliages, editors Joshua Lockyer and James Veteto (2013). "We Are What We Don't Eat: Worms, Bacteria, and the Soil Under Us" Parasites, Worms, and the Human Body in Religion and Culture, editors Misha Tadd and Brenda Gardenour (2012). “The Production of Post-Supernaturalistic Mythopoesis in Contemporary Nature Religion.” Worldviews: Environment, Culture, Religion, vol. 16.1 (2012).